It is now mandatory for NSW hospital doctors and nurses who work in high-risk patient wards to be vaccinated against the flu. Winter is here and so are strict new rules that make it mandatory for all doctors and nurses in "high-risk" hospital wards to have the flu shot. 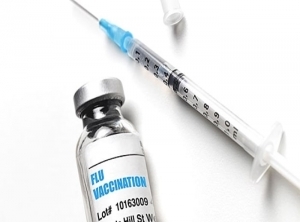 NSW has become the only state to make flu vaccination mandatory for medical staff in clinical areas such as neonatal, transplant and cancer wards. They must now show they have been vaccinated or they will be moved or forced to wear a mask. If they resist, they could be sacked. NSW Health Minister Brad Hazzard announced the move in March as part of its plan to protect vulnerable patients and prevent a repeat of last year's deadly influenza outbreak. Infectious disease expert, Professor Raina MacIntyre has not always been an advocate for such coercive action but said in this circumstance mandatory vaccination can be successful given the low uptake among healthcare workers. It's estimated only 16 to 60 per cent of health workers get the annual influenza shot, with an even lower rate reported among aged-care workers. "There has been a lot of research about health care workers and the kind of things that they should do for infection control, such as hand-washing, vaccination, wearing of masks, and across the board in most countries the research shows health care workers tend not to be compliant with these recommendations," said Prof MacIntyre, Head of the School of Public Health and Community Medicine, UNSW. Prof MacIntyre said for those who care for the sick and vulnerable, vaccination protects others from the devastating illness and even death. "People who care for the vulnerable should get vaccinated, like child-care workers, aged-care workers. They all need to think about getting vaccinated to protect the vulnerable people they take care of," she said.